After releasing the 1982's experimental A Kiss In The Dreamhouse, guitarist John McGeoch's alcoholism became too much of a burden to the band - he even collapsed onstage once - and he was then fired from the Banshees. Replacement was found in The Cure frontman Robert Smith who had previously played in the band in 1979, albeit only temporarily. This time, however, he wanted to document his stay as a Banshee, so after the group got back together (after the previous Banshee tour, Siouxsie and Budgie recorded their first Creatures LP Feast while Severin and Smith wrote a one-off album Blue Sunshine as The Glove) a live album Nocturne was recorded in 1983. But he also stayed onboard for a proper studio album which was released the following year. And this Sunday it's time to dig into that album, titled Hyæna. Now, the funny thing is that you can actually hear Smith's influence on the album - at least compared to the other Banshee stuff before it. This is most evident on the lead single "Swimming Horses", whose piano riff could easily come from an eighties Cure track. There are also some other songs on the album that remotely bring to mind Smith's own band, such as The Top album, also released in 1984. The organ-led "Take Me Back" for instance is one of the more Cure-ish tunes here. That is not to say that the album would be some kind of a Cure pastiche, though, but rather a blending of two musical directions: that of Robert Smith, and that of The Banshees. Hyæna feels like a natural continuation to A Kiss In The Dreamhouse's style. There's less variety in instrumentation but they retain a very experimental sound nevertheless. The songs are quirky and left field, which is obviously what you'd expect from Siouxsie and the Banshees tunes anyway. The previously mentioned "Swimming Horses" is driven by a bouncy piano riff while featuring lyrics that describe women abuse in Middle East - with cryptic metaphors, as usual: "Take a ride on the tide / With the assassins at your side". The cacophonic "We Hunger" is one of the darker tracks on the album, although it's still no "Night Shift" or anything. Indeed, Hyæna and Dreamhouse both mark a departure from the initial Banshee sound in the sense that while there is still darkness and gloominess in their songs, it's much subtler now - or at least, less plain. And then, the next two tracks "Take Me Back" and "Belladonna" are almost completely devoid of this darkness (save for Sioux's and Severin's enigmatic lyrics that are more than often way too vague for any kinds of definitive interpretations). Speaking of vague, "Pointing Bone" has probably some of the band's most obscure lyrics while apparently referring to some type of Aboriginal magic. Too bad the song doesn't really get anywhere. "Running Town", another Banshee tune with Cure-ish piano, is a hate song to cities where people are just rushing about in an endless hurry. To be more precise, she wrote the song about Sydney, which also adds the element of heat into the mix: "Helter skelter, all a swelter / The impetus is seething / in running town". An indisputable highlight is the album opener "Dazzle", which is a majestic anthem with glorious string arrangements (which Siouxsie actually wrote on a toy piano, there's your fun fact of the day). 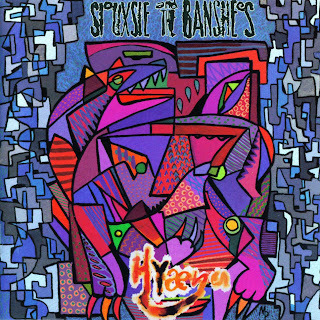 Siouxsie and the Banshees were a highly influential group, and although they're usually attributed for their impact on the darker side of the post-punk movement, you can really see echos of their work in modern-day art rock as well - just compare "Dazzle" to Arcade Fire's sound, for example. It's triumphant and it's gorgeous - no wonder it was chosen as a single. Other, more 'epic' moments on Hyæna are "Bring Me The Head Of The Preacher Man" that kicks off the latter half of the album and "Blow The House Down" that finishes it. The former is a fierce number that plays with imagery associated with the Wild West such as drooling vultures, preacher men or missionaries and the American dream. The latter is a frenetic seven-minute powerhouse that hardly has much to do with The Three Little Pigs; instead, it has Siouxsie singing about a horrifying storm, blowing houses down, turning people into ashes, throwing bishops from the windows. No biggie. Hyæna is often overlooked among the band's albums, even though it's not especially lacking or anything. However, it is a slightly mediocre effort for a group that created such masterpieces as The Scream and Juju. One could even argue that the they were a bit lost with their sound on the album - there's just that something lacking. The record is also a rather brief one with nine tracks, clocking at just over 40 minutes. Furthermore, although the Banshees were always a highly album-oriented group, here some songs do have a bit of a fillerish feel to them. Too bad. Interestingly enough, just before Hyæna the Banshees recorded a revamped cover of The Beatles' 1968 song "Dear Prudence", that became a big hit in the UK, giving them the highest chart position of their career (#3). Yet, they opted out of including the single on the album that could've really needed some more material to be honest. This wasn't exactly the first time they did something like that: their debut single "Hong Kong Garden" was an instant success, yet they left it out of their debut album. "Israel" and "Fireworks" were both equally great singles but similarly only got a stand-alone release. Hell, you could almost compile an album just out of their stand-alone songs! That being said, the album is redeemed by its highlights. And it's by no means as weak as some make it to be. It's an audacious, if a bit uneven record from a band going through their most experimental phase. It must also be said that the album still sounds very nice, even thirty years later. It might not be one of the Banshees' definitive moments - which is why I would probably recommend some other album for a first listen for people unfamiliar with the band - but it's still an interesting, experimental art rock album. If you're an album listener, that is. Otherwise there is at least a handful of songs you might want to check it out. In the end, Hyæna is an enjoyable album unfairly shunned just because it happens to pale in comparison with the group's other work. Try at least: "Dazzle", "Swimming Horses", "Bring Me The Head Of The Preacher Man"